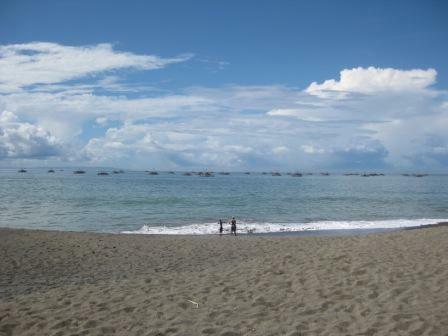 About 90 km south of Bogor, Pelabuhan Ratu is a popular seaside retreat for many Jakartans. The road to get there, however, was once again awful and a torrential downpour on our arrival did a lot to dampen our enthusiasm as we arrived at the Ocean Queen Resort for three nights. Our first puncture and tyre change didn’t help either. The Toyota struggled on the hills: the 1.5 litre engine failed on a few gradients and the air conditioner needed to be switched off. The smell of a burning clutch… the car will appreciate the return of our driver and the journey to and from work come Monday. 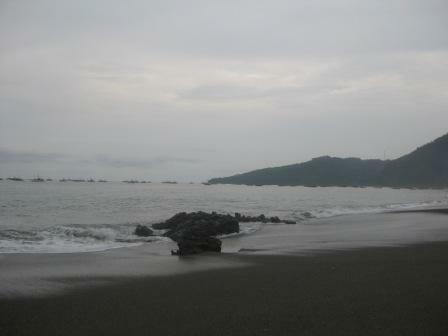 The beach at Sukabumi was a large horseshoe-shaped piece of black sand with fishing boats anchored offshore. The only splash of colour came from the model fishing boats sold along the shore by young boys. We buy one, of course, without haggling over the price in the rain. 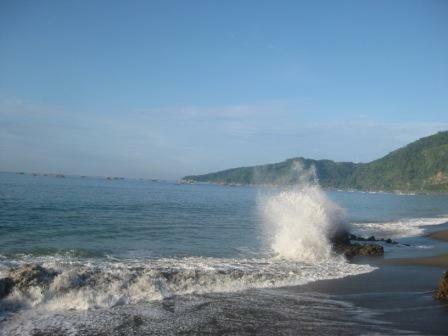 There is always sunshine after rain – and big waves. 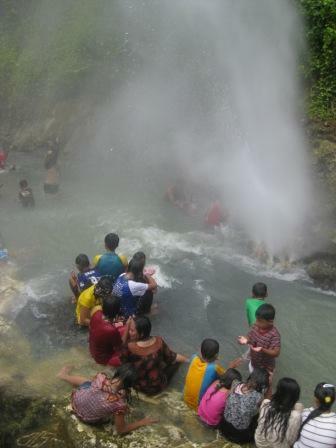 A wonderful experience at the hot springs at Cisolok. 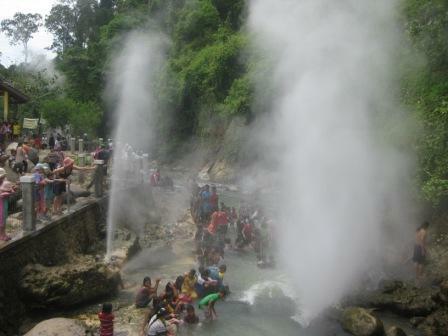 Boiling water sprays into the river and bathing pools have been created at the side. Huge crowds, families and sellers swarm over the site. We try a dip in the river but the smell of sulphur is quite strong. We pay to enter the pool areas. Very warm water and thoughts of cleanliness forgotten as we soak it all in. You can just make out Shona and the boys reaching out to try to touch the water spraying up.